It was an otherwise ordinary Monday night in September... Christina was at an event with her Occupational Therapy class and Zac was studying for exams. The first thing Christina noticed when walking into the house were the dogs meeting her, one dressed up with a pink flower and the other in his cardigan and dinosaur bow tie. She was commenting on how cute they looked when she noticed the mantel. Sitting upon it were the boards covered in handprints and a message "Christina will you marry me?" She was surprised but naturally, she said "Yes!" After the proposal, Christina had to move to Greenville, SC for six months of rotations to complete her Occupational Therapy schooling. That meant she had to be away from her new fiancé! They would drive 2-3 hours, meeting with each other every weekend. During Christina's last weekend in Greenville, the couple took my Wedding Ring Workshop. They spent all day making each other's rings and then happily drove back home to Charleston - together again! The couple had a traditional Vietnamese tea ceremony with their closest friends and family, and had the big celebration the following day. 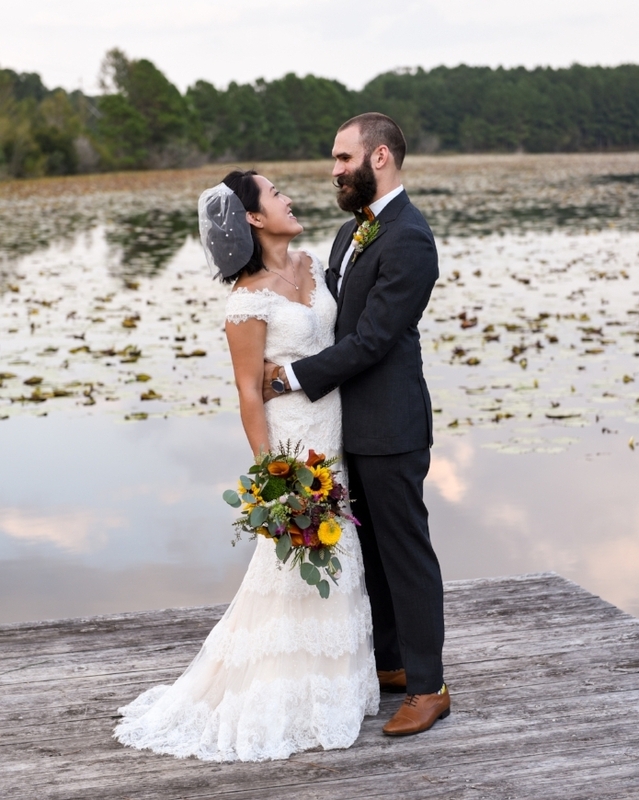 The wedding ceremony took place on a small island connected via walking bridge to The Lake House at Bulow. The reception was held in the backyard dock, at the edge of the lake. It was a beautiful natural setting and all very laid back... It was the perfect "meeting" time and place for Christina and Zac!